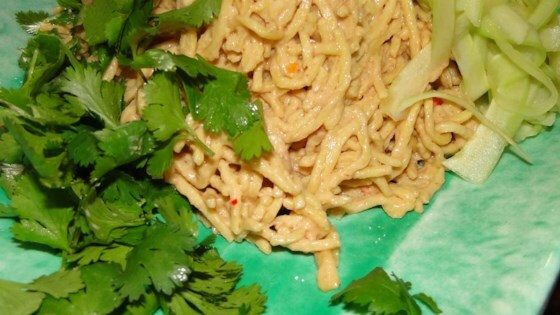 "Cold egg noodles are tossed with fresh cilantro and cucumber and dressed with a tangy peanut sauce to make a delightful summertime treat in this recipe." Stir together the peanut butter, peanut oil, tea, ginger, garlic, jalapeno pepper, salt, sugar, soy sauce, vinegar, and sesame oil in a large mixing bowl until incorporated. Place the egg noodles in a large bowl; add the cucumber and cilantro and mix together with your hands. Pour the peanut sauce over the noodles; mix with your hands until evenly coated. I made this a couple nights ago and noone would touch it. This was a waste of time and ingredients. I made this exactly according to the recipe. I made this for a Halloween potluck; it was very well received. I included 1 cup of chopped green onions to garnish and balance out the cilantro flavour. Easy dish to make. I cut the egg noodles to 1 lb and added 1 lb of cooked shrimp. Perfect hot weather meal. Excellent. Great dish for summer. Good recipe! We used regular spaghetti instead of the egg noodles - and turned out great. I'm sure glad I had all the ingredients on hand. I'd hate to think I made a special trip to the store for these results - I followed the recipe to a tee. It tastes like straight peanut butter. Really great and easy!! I didn't use all the peanut butter it called for, just enough to give it the flavor. I bought the peanut oil just for the recipe but it wouldn't have been necessary.